From Strangers to Best Buds! 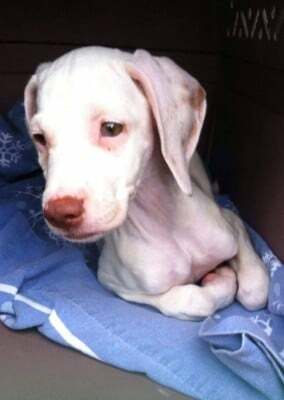 Troy, VA — This past week, volunteers came together using the Doobert.com software to transport a deaf, eight-week-old English pointer from Savonburg, KS to Troy, VA. The puppy, now named Doobert by volunteers, arrived at a rescue in bad condition. The previous owner irresponsibly bred Doobert, causing him to be deaf and underweight. His breeder did not give him a name due to his deafness. Thanks to Transport4Rescues, Deaf Dogs Rock, and Green Dogs Unleashed, Doobert gets a new chance at a foster home in Virginia. Deaf Dogs Rock is a website dedicated to helping rescue dogs that are deaf. They reached out to Green Dogs Unleashed, Doobert.com, and Transport4Rescues to find Doobert the pup somewhere to live. Green Dogs Unleashed is a group that trains and finds homes for special needs dogs. They found a foster for Doobert in Virginia. Transport4Rescues volunteers then used the Doobert.com software to organize the over 1,000-mile trip. Doobert the dog arrived safely to his foster home and is now adjusting to his new home and other dogs.